Description Painted in Rome, this tondo (circular painting) of the Virgin and Child employs a rare motif of flanking candelabra that was derived from representations of ancient Roman emperors. Through this reference to the rulers of antiquity, Raphael alludes to Christ's and Mary's roles as the king and queen of Heaven. Raphael was famed for his graceful style. which combined the study of classical sculpture and nature. The chiaroscuro effects (modeling in light and shade) and gentle coloring give the figures a soft, delicate appearance. The painting relies heavily on the participation of Raphael's workshop, and the two angels certainly were done by his assistants. 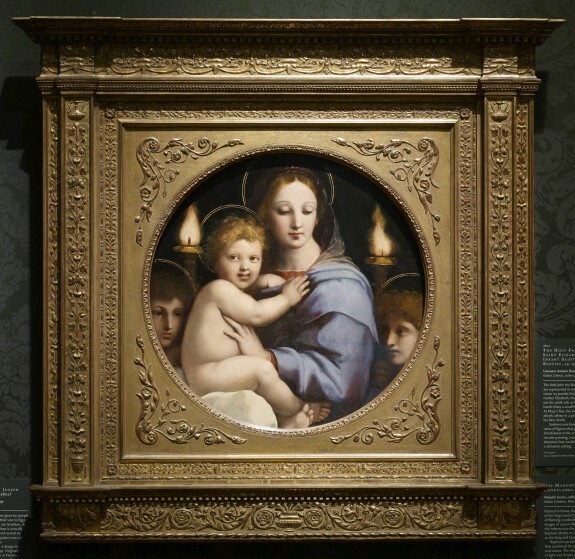 This was the first Madonna painted by Raphael to enter a North American collection. Unknown Exhibition Title. The Metropolitan Museum of Art, New York. 1882-1884. God's Minstrel: St. Francis of Assisi. The Walters Art Gallery, Baltimore. 1982. Raphael and America. National Gallery of Art, Washington. 1983. Raffaello. Da Firenze a Rome. Galleria Borghese, Roma. 2006. Late Raphael. Museo Nacional del Prado, Madrid; Musée du Louvre, Paris. 2012-2013. Provenance The Princes Borghese, Palazzo Borghese, Rome, prior to 1693 [1693 inventory, Room IV, no. 45]; Sale, Rome, 1797-1799; Lucien Bonaparte, prior to 1812 [mode of acquisition unknown]; Maria Luisa, Queen of Etruria, Lucca [date of acquisition unknown], by purchase; Charles Louis, Duke of Lucca [date of acquisition unknown], by inheritance; Sale, Phillips, London, June 5, 1841, no. 51; William Buchanan, 1841 [mode of acquisition unknown]; Hugh Andrew Johnstone Munro, Novar, Scotland [date and mode of acquisition unknown]; Sale, Christie's, London, June 1, 1878, no. 153; Henry Alexander Munro Butler-Johnstone [date and mode of acquisition unknown]; Sydney Edward Bouverie-Pusey, 1882 [mode of acquisition unknown] (?) or 1884, by purchase (? ); Ichenhauser, London, 1900 [mode of acquisition unknown]; Henry Walters, Baltimore, 1901, by purchase; Walters Art Museum, 1931, by bequest.